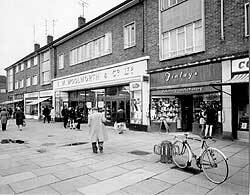 Bletchley's main shopping area has always been Queensway, although before the Queen's visit in April 1966 it was known as Bletchley road. 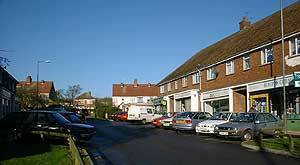 Many of Bletchley's estates have their own small local shops. 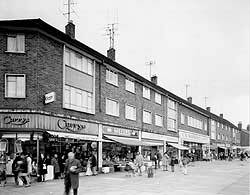 The Saints estate, the town's first London 'overspill' estate, was provided with a cluster of shops - in St. Mary's Avenue - as was the Lakes estate, Bletchley's last 'overspill' area. Every town, however, needs a proper shopping centre. As early as 1950, Bletchley Urban District Council were concerned that the amount of shop space in Bletchley road would be inadequate for the proposed town expansion. John F. Smithie, the then Engineer and Surveyor to the council, wrote in that year that Bletchley had 3,800 feet shopping area frontage, plus 1,560 feet in nearby Aylesbury street, Fenny Stratford. Working on the basis of 28 feet frontage for every 100 people, 5,360 feet was enough shopping length for a population of about 19,000 - but Bletchley was expecting to soon be providing facilities for 21,400 people. A concerted effort to develop the shopping centre was therefore required. Some properties in Bletchley Road at that time were still residential and it was noted in Mr. Smithie's report that their 'protruding gardens form a physical obstruction to shoppers'. A compulsory purchase order was issued to buy up these properties in order to develop the area properly. Many of the shops in the 1950's were small privately - run shops, not the chainstores that we are accustomed to today. Bletchley Road ran straight through the centre of town then, the ring road did not come into existence until the early 1970's. A row of little 'tin hut' shops stood underneath the railway bridge on the way into town from the Buckingham Road direction. Mrs. Attwell, originally from London, remembers the early shops. Bletchley's 'tin hut' shops under the flyover. Right: F.W. Woolworth & Co. in Queensway. 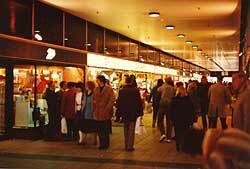 By 1965, a survey of Bletchley shopping centre saw a retail turnover in the region of £4,250,000, which was considered below average when compared with similar size towns. Provision of further retail was considered necessary to support a population of 42,500. Bletchley's expansion had, of course, proceeded rapidly since initial concerns were voiced in 1950 and in 1965, had still not reached an end. Additionally, by 1970, Queensway was expected to be the area's main shopping centre until the new town of Milton Keynes would be up and running. The Brunel Centre was built in the 1970's.This indoor shopping arcade could be reached by a pedestrian underpass by shoppers coming from the Buckingham Road direction. By this time, Queensway was no longer a through-road - Princes Way now took traffic round the back of the town centre. The Brunel Centre housed W.H.Smith, Kash and Karry fabric warehouse and Boots as well as several other retailers. In recent years the centre has been much improved with the construction of a high glass roof and new flooring - having previously been quite a dark area. The Brunel Centre in the 1970's. Bletchley as a shopping centre has been somewhat eclipsed these days by the major shopping centre at nearby Central Milton Keynes. Many local residents, however, still use and support Queensway and it continues to be a busy street on a Saturday afternoon. Return to A Joyful, Royal Day.